ImportCoord is a VBA add-on application for Autodesk Inventor allowing to read in sketch splines from coordinates stored in Excel sheets. Simplifies creation of irregular 3D objects driven by computed or digitized point coordinates. Allow to sketch graphs of mathematical functions. You can also import named 3D workpoints. In the Tools menu select Macro Visual Basic Editor. In the Microsoft Visual Basic window select File Load Project. Select the project file ImportCoordinates.ivb. In Microsoft Excel open the sheet with point coordinates. Note Coordinates must be stored so that X coordinates are in one column and Y coordinates in another column. In Autodesk Inventor start a new part file and a new sketch (or leave the active sketch). Warning This function requires an active sketch. If no sketch is active this function will not work. In the Tools menu select Macro Macros. In the Macros dialog, in the Macros in list select the All application projects and Active Documents option. In the Macro Name list select the Module1.ImportCoords item. 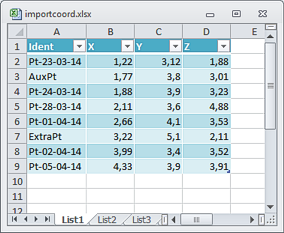 In the Point import dialog enter the values depending on the format of your data in the Microsoft Excel sheet (enter the number of column containing X-data, column with Y-data, etc.). 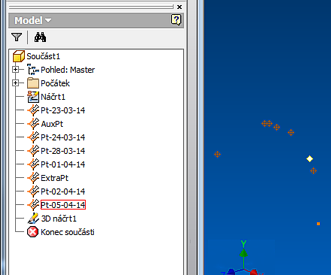 The 3D points option imports 3D coordinates as WorkPoints (instead of 2D splines). The 3D spline option imports 3D coordinates as 3D spline (a new sketch object introduced in Inventor R8). Run the macro using the OK button. After the macro finishes use the View Zoom All command to display the imported coordinates. They should result in a spline controlled by the values of Excel coordinates. The Scale factor option converts units without the need to recalculate them in the Excel sheet - AI works internally in centimeters while most coordinates are read-in in millimeters. This conversion is driven by the value of 0.1. Use the decimal separator as set in your operating system locale - usually a comma (,) in Europe. The Close spline option allows to close automatically the created spline (both 2D and 3D). Other than the scaling (scale factor) there are no processing performed on the imported coordinates. The resulting spline is an exact image of the coordinates from Excel - including their order and count. Non-numerical cell values from Excel translate to 0.0. In the Available references list unselect Missing: Microsoft Excel 10.0 Object Library. Close the References dialog with OK button. Save the updated version of the macro. ImportCoord is an adware by CAD Studio (AAC Solutions/Xanadu) and can be copied for free (unchanged contact info must be retained). Contact us for any required modification of this application or other Inventor application development.